7th Circuit Productions and Moksha Family Arts Collective presents Moksha Roots Live, the official after party for The Rhythm Foundation’s Big Nights in Little Haiti. Come out to party and vibe with us and support this ongoing monthly gallery opening and roots jam that brings together all the diverse roots of Miami…. An new up and coming local Haitian Band! 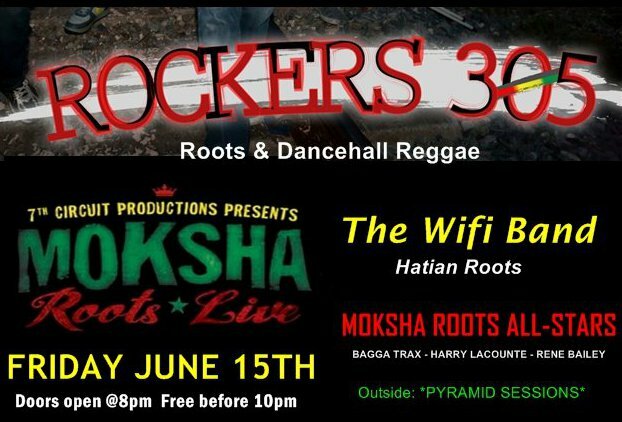 ROCKERS 305 is a rough and ready band of seasoned players pushing foundational roots and dance hall reggae into new heights. Their heavy mannered, break out live show gets the crowd on their feet and rocking in swing. artists as well as our local Miami artists. Special Guests from South Florida Circus Arts School! Gallery and yard open 8pm. Don’t miss our special event with ~JUNIOR REED~ Friday, June 29th!